Recently, we had an inquiry through our website from a woman in New York. She had inherited a sports card collection that had been in her family for decades. She contacted us about a “binder full of Play Ball cards”, which she hoping to get an appraisal on, and possibly sell outright. She was able to send us an image of the first binder page, which just so happened to be the first nine cards in the set, that included the coveted #1 Joe DiMaggio card! At this point, we knew she had a valuable collection and we wanted to see the balance of the set in person. She agreed to come down to our office in Somerset, NJ for an official appraisal. She made it very clear that she had done her research, from educating herself on how the selling process works, to looking through completed auctions to comprehend market values, to understanding the difference between Very Good and Near Mint with respect to the condition of the cards. Through her research, she had decided on three companies to evaluate her collection, with Just Collect being one of those. She "interviewed" all three, and decided rather quickly which direction she was going to go. Whether it was our honesty and sincerity, our transparent buying process, or the extensive knowledge of vintage cards, she decided to not even meet and visit the other two companies, and came directly to us. Upon arriving at our office, the woman produced the binder full of cards, all stored in the 9 pocket pages. She proceeded to explain that the cards had been part of her step-fathers' collection and that he had passed them onto her mother. With her mother’s recent passing, the collection was now hers, so she was interested in getting an appraisal on the collection, with intentions to sell. Scott Alpaugh, one of our vintage card specialists, examined the collection and immediately realized that this was more than just a "binder of Play Ball cards". 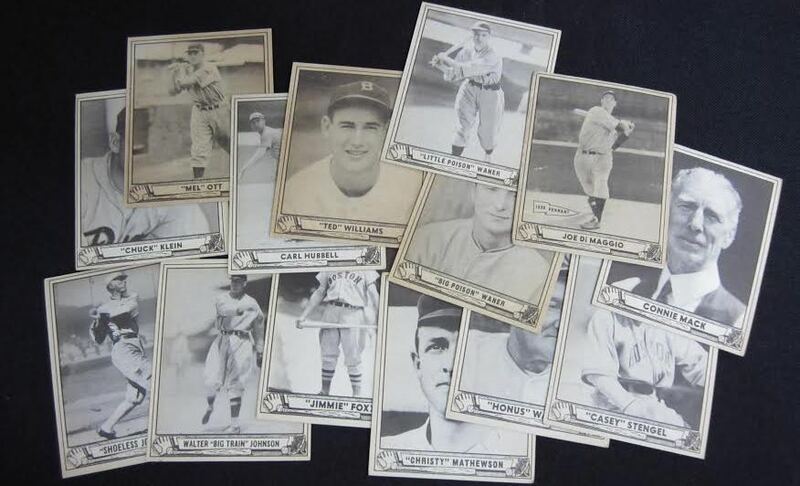 It was a complete set of 240 Play Ball cards from 1940, with the condition varying from POOR to NEAR MINT, with most cards ranging from EXCELLENT to EX/MT. To help establish a more accurate value, we identified the condition of many of the more valuable cards rather than just provide a simple estimate. Noting the condition and value for most of the major stars, including a #1 Joe DiMaggio in Very Good (VG) condition, #27 Ted Williams in Excellent/Mint (EX/MT) condition and card #225 “Shoeless” Joe Jackson in Excellent (EX) condition, helped establish a more accurate representation of the set in its entirety when combined with the valuation of the lesser stars, the commons, and high numbers. Mentioning just the Big-3 in the set would not do justice to many of the other stars that were present. The set was unique in that it also included many retired players along with the many active players. It is uncommon to find the likes of long-retired Walter Johnson, Honus Wagner, Joe Jackson and Frank “Home Run” Baker in a set that also includes active stars like Carl Hubbell, Bill Dickey and the afore mentioned DiMaggio and Williams. One of the greatest obstacles when trying to purchase collections is reaching common ground with the seller on condition. Since condition typically predicates the value, and grading can be somewhat subjective, it is best to get on the same page from the start. A good rule of thumb: If you have cards that are 50+ years old, they aren't going to be in Mint condition. We reviewed many of the cards in the collection, both the good and the bad, with the woman and discussed the conditions. Once we reached agreement on the relative condition of the star cards, and the condition of the balance of the rest, we discussed our findings with regard to the total value of the collection. It is rare that we’re as close in actual condition and value as we were with this woman. She had really done her homework and didn’t have the typical mindset that her cards were better than any others – she was very realistic. Often, sellers overestimate the condition and value of their collections, sometimes over-grading and calculating values at 3-4 times more than the current market. She was spot on! It's like that old saying, "an educated consumer is our best customer". That certainly holds true in the vintage card business. We made her our best offer possible and advised her that our offer was good as long as the collection remained intact. We were very comfortable that our offer would be the best and realize that by being competitive, we are often far exceeding the purchase offers of our competition, so, in essence, we're bidding against ourselves. But then again, you are not able to purchase great collections like this 1940 Play Ball set by making low offers – that is simply a shortsighted business model. Several anxious days passed as we waited on the verdict. There weren't any plumes of white smoke spewing from the chimney, but when she finally reached back out to us, she asked, “Does your offer still stand?” Our answer was an emphatic “Yes”... as long as the set was still intact and in the same condition as it was when we previewed it. She confirmed it was, and eagerly scheduled another appointment to come in. We reexamined the set, agreed to the purchase price, paid her in cash, and we both left happy with the results of the transaction. We will be sending a few of these cards off for grading and will be offering the balance of the cards from the set for auction in the coming weeks via our eBay listings. I think this whole transaction was awesome for many reasons! The first one is obvious, we bought a complete set of 1940 Play Ball cards. That certainly doesn't happen everyday. The second reason, and maybe most important, is the fact that this woman, who had no idea who I or Just Collect was two weeks ago, decided to travel over 100 miles to come see us, while not even meeting with the other companies! That goes to show you how far customer service and reputation goes - something we take great pride in. The third reason sort of ties into the second, which is the fact that she found us through a Google search. We are definitely not local, and I'm sure she had her fair share of hyper-local card shops and buyers to choose from. If you remember from a previous post, I'm very proud of how far we've come with our website, our visibility on the web, and the trust that our brand carries throughout the hobby. So, for her to pick us out of everyone else speaks volumes - something the entire staff here at Just Collect is proud of. So, do you have a collection you are looking to sell, and have an interesting story behind it? Have you wondered what it is worth or what someone would pay for it? We'd love to hear from you! Call us today to find out what your collection is worth and how you can have a cash offer within 24 hours!